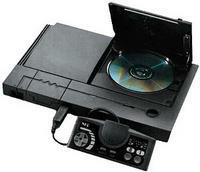 The PC Engine Duo made it to the United States as the TurboDuo in 1992, but never reached Europe. It was marketed by new company Turbo Technologies Inc. (TTI), which consisted of ex-employees from both NEC and Hudson Soft, after the apparent failings of the TurboGrafx-16 campaign. The console contained a TG-16 and the newer Super CD-ROM unit which were unified in a single case, along with the Super System Card integrated on the motherboard and buyers received quite a package for their money. A control pad, TG-CD versions of Ys book I & II, a compilation of four Super cd games and a TurboChip game were all included in the $299 price tag. There was no escaping the fact that this was still a system based on ageing 8 bit technology though. The TurboDuo (also called Turbo Duo) is a video game console released in the United States on October 10, 1992 byTurbo Technologies Incorporated, a Los Angeles-based corporation consisting of NEC and Hudson Soft employees, established to market NEC consoles in North America after NEC Home Electronics USA failed to effectively market the platform. The Duo was codeveloped by Hudson Soft and NEC. The Japanese counterpart was the PC Engine Duo game console, which was released over a year earlier. CPU: 8-bit HuC6280A, a modified 65C02 running at 3.58 or 7.16 MHz (switchable by software). Features integrated bankswitching hardware (driving a 21-bit external address bus from a 6502-compatible 16-bit address bus), an integrated general-purpose I/O port, a timer, block transfer instructions, and dedicated move instructions for communicating with the HuC6270A VDC. GPU: A dual graphics processor setup. One 16-bit HuC6260 Video Color Encoder (VCE), and one 16-bit HuC6270A Video Display Controller (VDC). The HuC6270A featured Port-based I/O similar to the TMS99xx VDP family. The vast majority of TurboGrafx-16 games use 256×224, though some games, such as Sherlock Holmes Consulting Detective did use 512×224. Chris Covell's 'High-Resolution Slideshow' uses 512×240. Palette: Each sprite can use up to 15 unique colors (one color must be reserved as transparent) via one of the 16 available sprite palettes. Layers: The HuC6270A VDC was capable of displaying one sprite layer. Sprites could be placed either in front of or behind background tiles. Palette: Each background tile can use up to 16 unique colors via one of the 16 available background palettes. The first color entry of each background palette must be the same across all background palettes. Layers: The HuC6270A VDC was capable of displaying one background layer. CD titles add Redbook CD-DA sound, and a single ADPCM channel to the existing sound capabilities of the TurboDuo. TurboChip (HuCARD in Japan): A thin, card-like game media. The largest Japanese HuCard games were up to 20Mbit in size. Excluding the TurboExpress (TurboChip only), all TurboGrafx-16 hardware could play the entire TurboChip library, and every CD system could play all the various CD format games - with the right system card and/or HuCARD adaptor. Interestingly, Japanese systems cannot play US TurboChips without a required internal modification. Some modifications allow Japanese systems to play US and Japanese cards right from the HuCARD port, other modifications require a HuCARD converter as well.